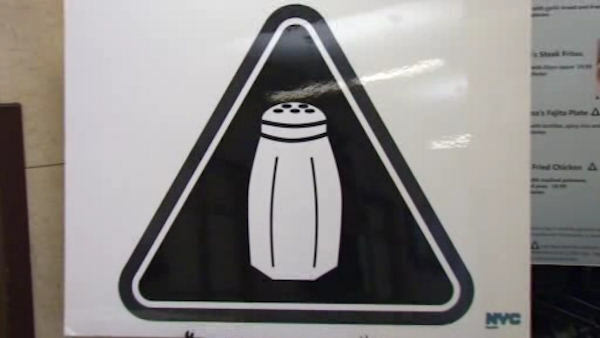 NEW YORK (WABC) -- The New York State Supreme Court will hear arguments on Wednesday challenging a new rule requiring salt warnings on some New York City menus. The National Restaurant Association filed a challenge to the city-wide mandate. The association says the health board overstepped its legal bounds and is muddying waters at a time when federal regulators are working on nationwide menu labeling rules. The suit also brands the salt warning "nonsensical" in applying to only some food vendors and argues it violates restaurateurs' free speech rights by forcing them to post a warning they dispute as based on "scientifically controversial opinion." Starting March 1st, restaurants with 15 or more locations will have to warn consumers about menu items that contain more sodium than the daily recommended limit. Those menu items will have a salt-shaker icon on them. The recommended daily limit of sodium is 2,300 milligrams which is about a teaspoon. Public-health experts say the symbol will help diners see how salty some dishes can be. Some cheeseburgers can count over 4,000 mg of salt, for instance. Even some salads can top 3,000. The salt warning will apply to an estimated 10 percent of menu items of chains with at least 15 outlets nationwide, according to health officials. They say those chains do about one-third of the city's restaurant business. Despite the lawsuit, some chains are on board with the salt warning rule. Panera CEO Ron Shaich has said he supports it, and 40 New York City-area Applebee's made a point of complying before the effective date, with Apple-Metro CEO Zane Tankel saying he felt it was important to give customers information.